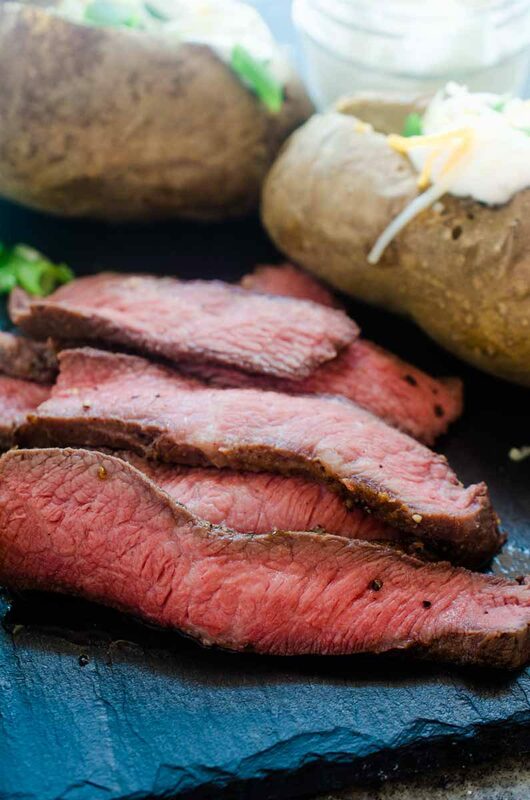 The technique of cooking sous vide steak provides you with a perfectly cooked steak every time. 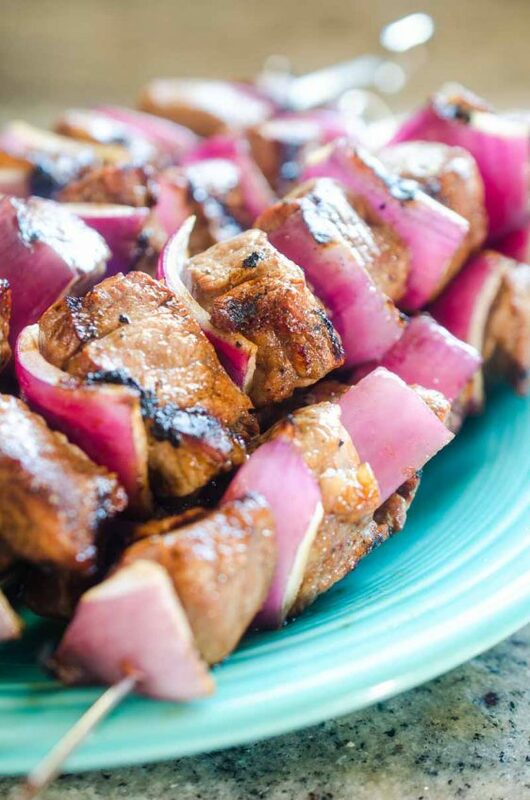 It’s incredibly easy and makes the most flavorful steak. Ryan and I had a sous vide steak while dining at Red Cow here in Seattle for one of our anniversaries. I ordered the medium rare rib-eye. The server told me “We cook it sous vide, so it will probably taste a bit different than you are used to.” I ordered it anyway. You guys, it was like butter. I barely needed a knife to cut it. And from that point on, a sous vide machine was at the top of my wish list. This past Prime Day, I got one. And LORDY, I don’t think I’ll ever cook steak another way. What does sous vide cooking mean? 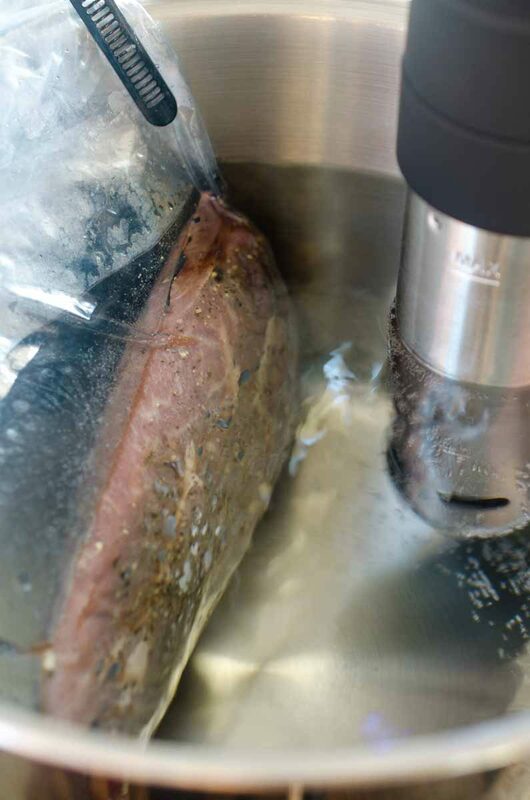 Sous vide is when a food is placed in a plastic pouch and cooked in a water bath for longer than normal cooking time. One of the beauties of sous vide cooking is that you can cook the meat ahead of time. So when you’re having a party, cook it in advance, a quick sear when your guests arrive and you are good to go! 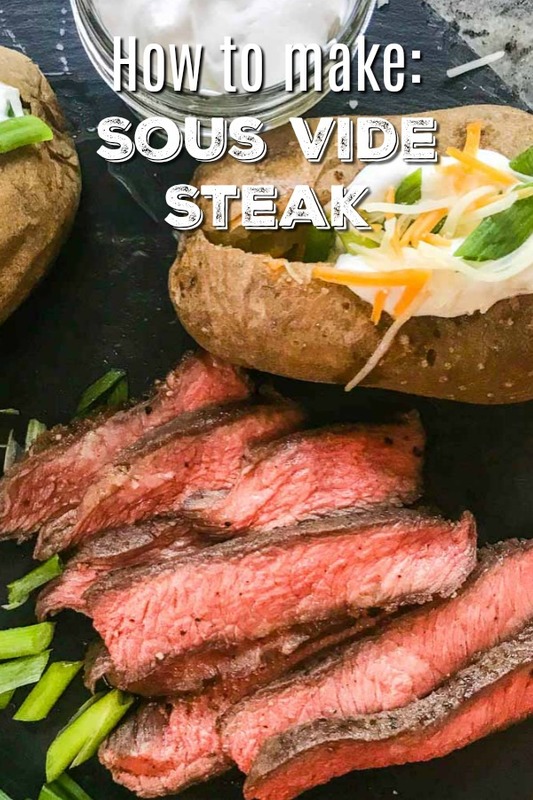 Do you need a sous vide machine to make sous vide steak? For this recipe you do. Until recently sous vide machines were pretty big and took up a lot of real estate in the kitchen. Now with new machines like the Anova (the one I own), they take up a lot less space. To make this sous vide steak you will need a sous vide precision cooker, a pot of water and a zip loc bag. Note: This is not a sponsored post. The fine folks at Anova don’t even know me. I just love the product. Do you need a vacuum sealer to cook sous vide steak? Nope! You can certainly use one if you have one, but I have found that a resealable ziploc bag works well too. You simply place the meat and any seasonings in the bag and zip it almost all the way closed. Then slowly lower the bag into the water and the water will push out the air. It’s the water displacement method, and I’ve found it works perfectly. I use a clip to keep the pouch close to the edge of the pan, away from the circulator. 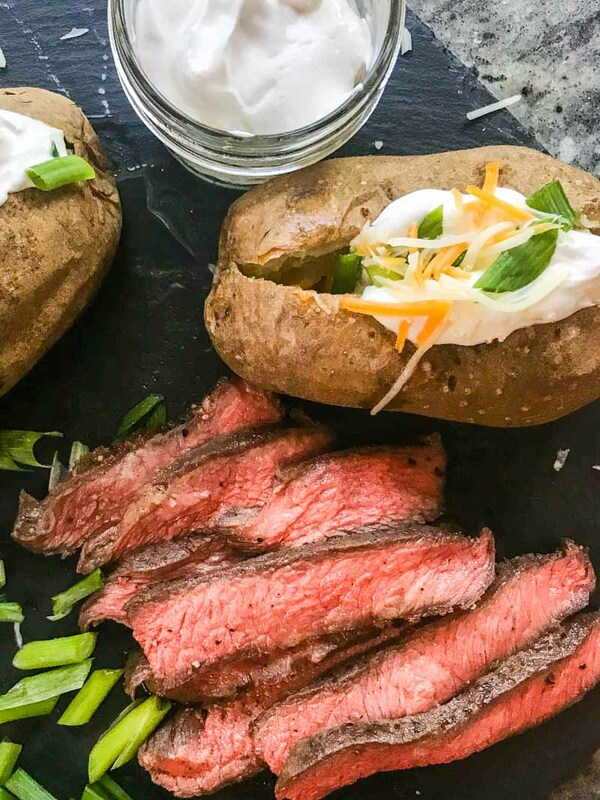 Overcooking is so easy to do when you’re grilling a steak, but with the sous vide you don’t really have to worry about that! It reaches the desired temperature and does not go over that. As far as time goes, you can expect a 1″ thick steak to take 1 hour to reach the desired temperature. When making sous vide steak, in order to get the caramelized color on the outside, you will also need to sear it once it finishes the cooking in the water bath. This will also, obviously, cook the steak a bit more so you need to keep that in mind. Sear it in a piping hot pan for 30 – 60 seconds on each side, then let it rest before slicing. 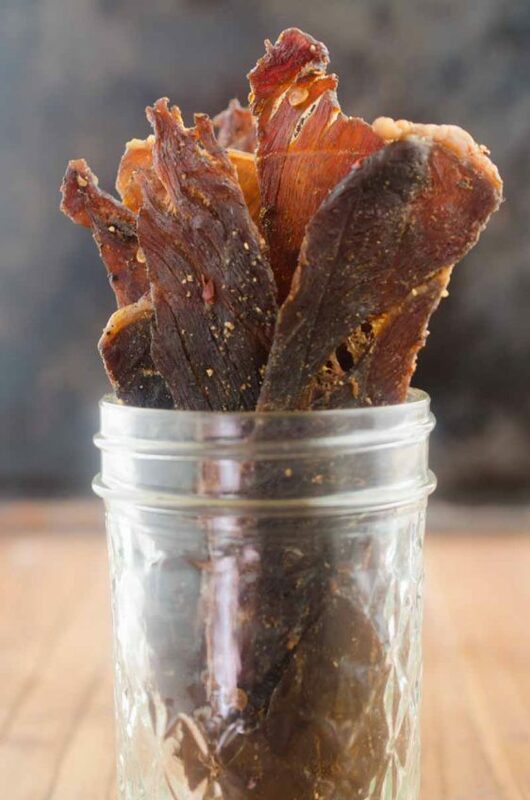 What cut of steak should I use to make sous vide steak? I have used top sirloin, NY Strip, Rib Eye and Flat Iron to make sous vide steak. Again, you are going to get the best results with a steak that is at least 1 inch thick. Each one of these cuts worked very well in the sous vide, but to me, the Flat Iron Steak stood out as the best. Cooked at 130 degrees for 2 hours which a quick sear in a cast iron skillet and it was like buttah. 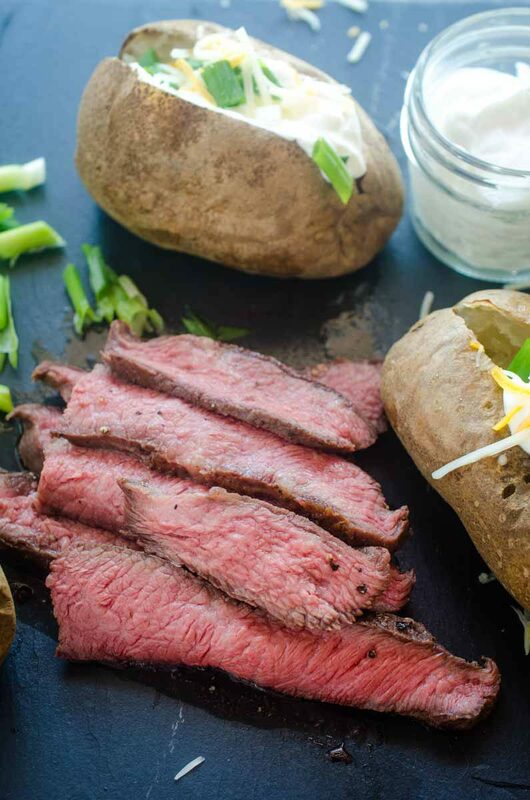 If this is your first trek into the sous vide steak world, using a flat iron steak is the perfect place to start. 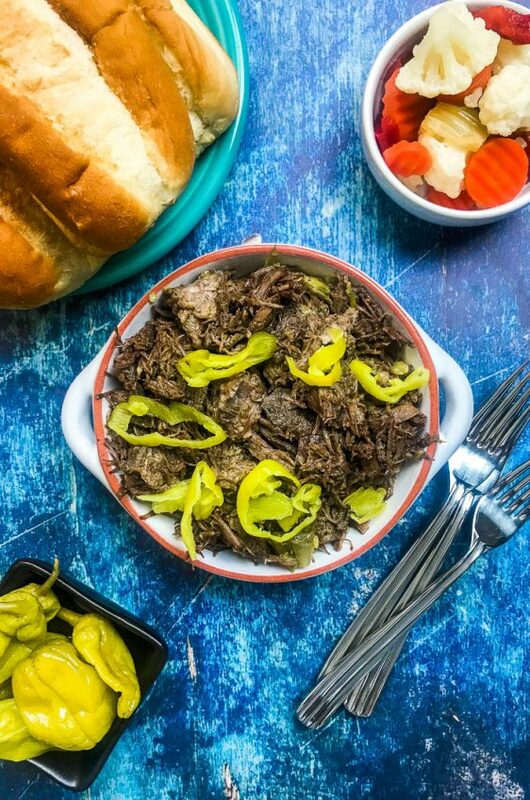 It’s affordable and flavorful and one steak can feed a family of four. Which seasonings should you use for sous vide steak? You don’t need a lot of seasonings. I like to keep things simple. 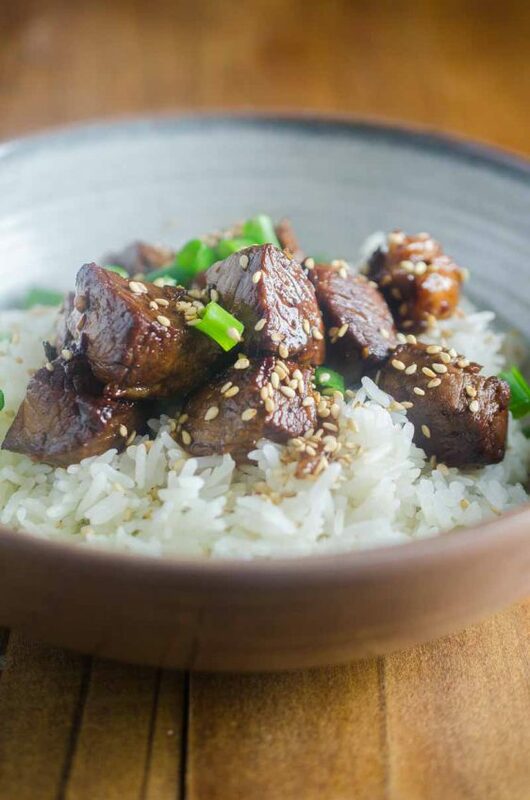 For this recipe, you will need salt, pepper and garlic. That’s it. 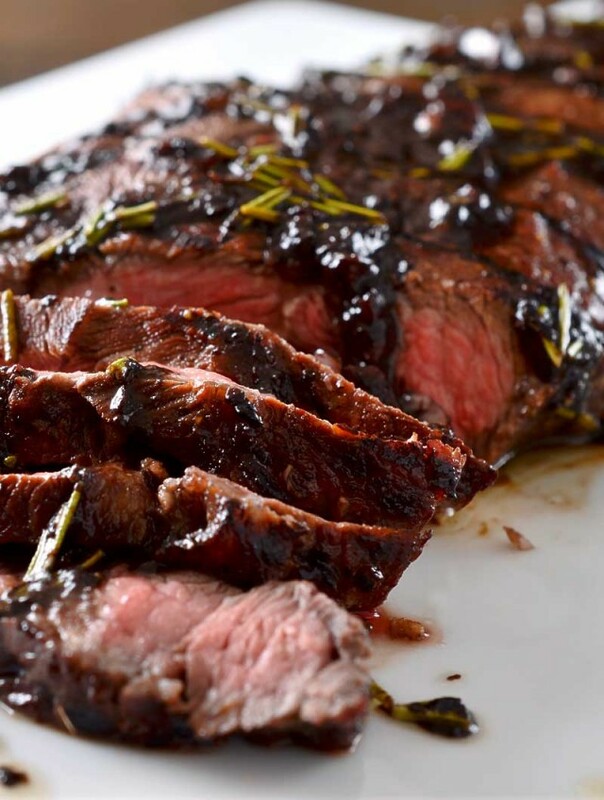 That being said, I might give it a go with my Rosemary Balsamic Flat Iron Steak too. I’ll keep you posted! And while sous vide steak is awesome, the sous vide precision cooker also works well on other meats and vegetables. 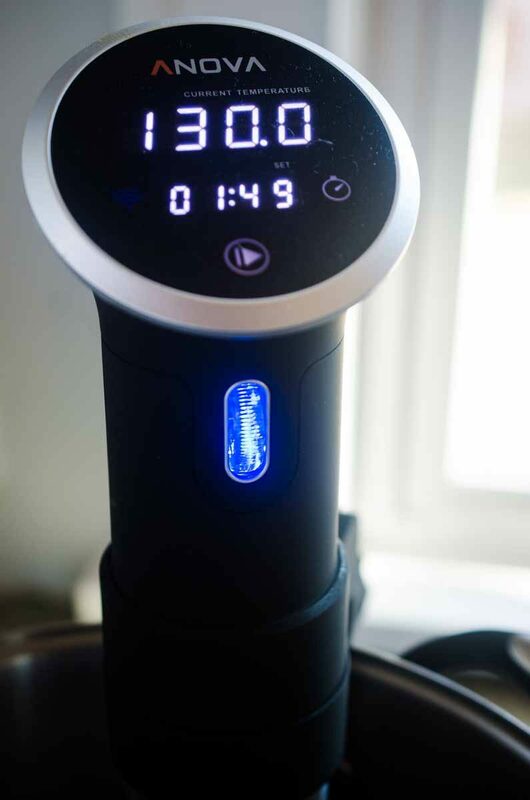 If you want to learn more about Sous Vide cooking Serious Eats has a Sous Vide 101 article with lots of info. Set the precision cooker to 130 degrees. 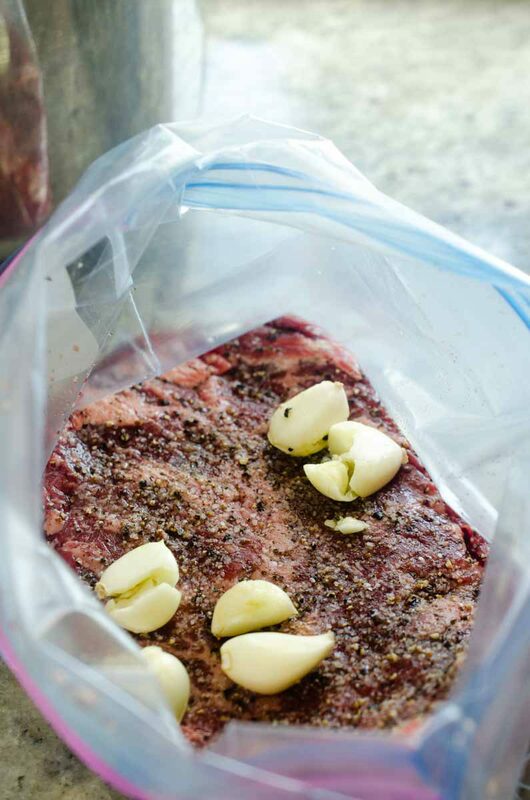 Place the steak and garlic in a 1 gallon resealable plastic bag. Slowly lower the steak into the water, allowing the water to push the air out. Seal the bag. Ensure that the entire steak is submerged in the water. Use a clip to keep the bag close to the side of the pan. Set timer for 2 hours. After two hours, remove steak from bag and pat dry. Heat oil in a skillet over hight heat. Once the oil starts to shimmer cook steak 30 seconds on each side. Transfer to a cutting board and let rest for 10 minutes. This steak is cooked perfectly! 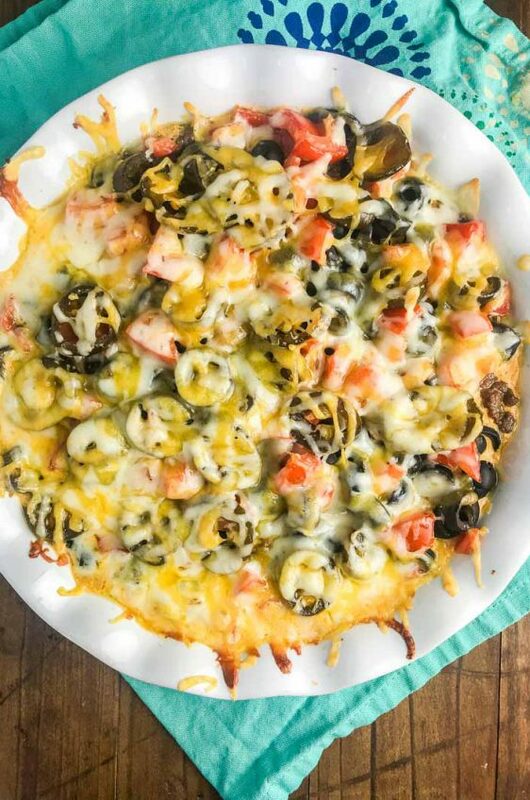 I have to make this for dinner asap! OMG! 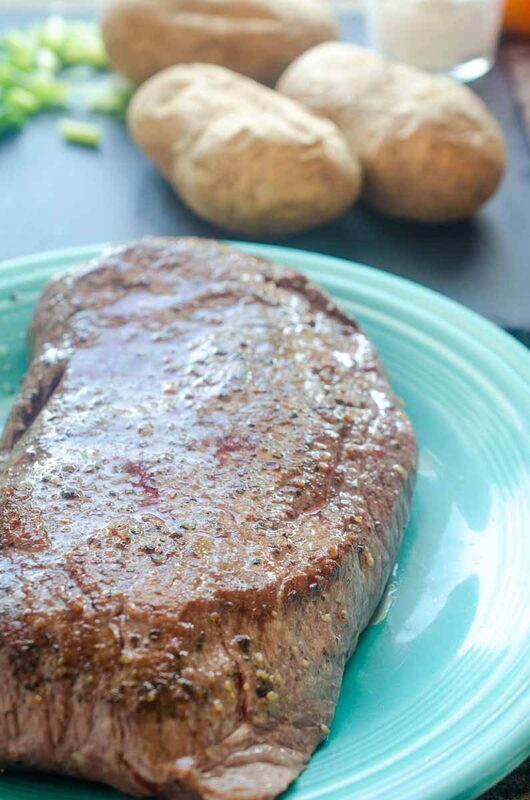 This steak has the perfect texture! That’s what I call a good steak! Absolutely love cooking with my sous vide. My husband absolutely loves this, I highly recommend it!